Malaysia: The tale of two halves. From leech bites, soaking wet clothes and aching muscles to pure white sand, clear water and coral reefs; the areas that I explored in peninsular Malaysia couldn’t have been more different. However, before you stop reading and think that the former sounds more like hell than a holiday, it might surprise you to hear that I think about trekking through the oldest rainforest in the world nearly every day. It was the most demanding ecotourism trip of this year but I find myself talking about ‘how long it took to start fire to keep warm’ and ‘the number of mosquito bites on my face’ to anyone who will listen. Why? Because this experience took me out of my comfort zone and taught me skills that I never even knew I could learn. Also, what we found in that rainforest was worth every moment of discomfort. Finishing the tour on a tropical island had never felt so luxurious after sleeping on the forest floor for nights on end. For me, this trip had the perfect balance of challenge and chill time. In terms of wildlife, Malaysia is one of 12 mega-diverse countries with a huge number of endemic (not found anywhere else in the world) species. A whopping 20% of the world’s animal species are found in this tropical country and two-thirds of Malaysia is covered in forest (some believed to be 130 million years old). 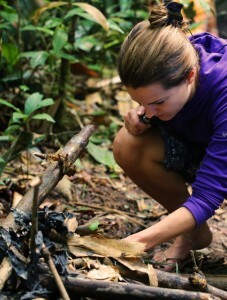 However, like many places on our planet, deforestation, illegal fishing and poaching are huge concerns in this region. Due to habitat loss and illegal poaching, the Malayan Tiger population is at a terrifyingly low 240 individuals; however, they may be making a comeback! The City of Ipoh is about a three hour drive from Kuala Lumpur (depending on traffic) and is the gateway to the Cameron Highlands. With our fantastic guide Pavin, we hiked 18km from Tanjung Rambutan to the top of Mount Korbu through almost pristine rainforest and, along the way, we set camera traps to access the mammal populations in the area. If you’re after a luxury getaway, you’ll be sorely disappointed. This is more like an expedition where you’ll put up your own hammocks and tents and cook your own dinners on a fire. You’ll also need to be physically fit and accept the fact that you’ll have a few leech and mosquito bites. You soon get used to leech bites as you’ll learn to just let them take their feed and then they fall off! However, on the plus side, you’ll get to bathe in tropical waterfalls, wake up to the forest orchestra and learn forest survival skills that even Bear Grylls would be proud of. My personal low point hit when, after a night of torrential downpours, I woke up to find all of my clothes soaking wet. Putting on wet socks before a full day of hiking is not a comfortable combination. 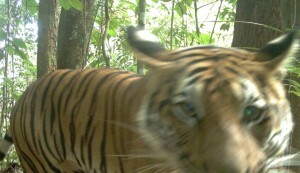 However, when the camera traps revealed that the Malayan Tiger was present in the forest where we’d been trekking, every moment of discomfort ebbed away; in its place were goosebumps and a sheer joy that these charismatic creatures are in areas where previously they were thought to have been driven out of. After all of that walking and climbing, you’ll enjoy sitting down for about 6 hours while you’ll travel to the east coast and jump on a speedboat to the Perhentian Islands. This tropical paradise is just the place to relax those aching muscles. Here, you can snorkel or dive on the coral reefs with green turtles and blacktip reef sharks. I travelled to the islands in June and was lucky enough to witness a female green turtle laying her eggs one night. 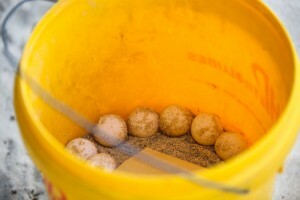 Please note that sea turtles are very sensitive to light so no torches, cameras or phones are allowed when watching the turtles lay their eggs. The volunteers are there to tell you all of the dos and don’ts. Finally, if the camera traps in the forest whetted your appetite for conservation research, you can help the Perhentian Turtle Project by photographing the turtles during one of their snorkelling tours. From these photographs, the researchers can identify the individual turtles from their markings and find out about their behaviour. What a fantastic way to help conserve species while on holiday! 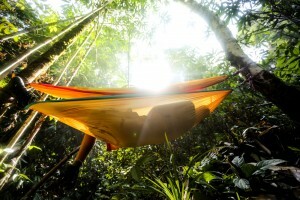 Both of these ecoadventurers in Malaysia were run by Fuze Ecoteer and I booked these trips through Inspired Escapes.